Discussion in 'Weapons, Technology & Equipment' started by Peter Clare, Aug 5, 2007. Interesting website on an unusual aspect of the war. did not realize that they were still in use so long after the war! Was that where "Radio Caroline" was situated? Did a little checking and now remember "Radio Caroline" was on a ship. However radio stations were set uo on some of these structures. 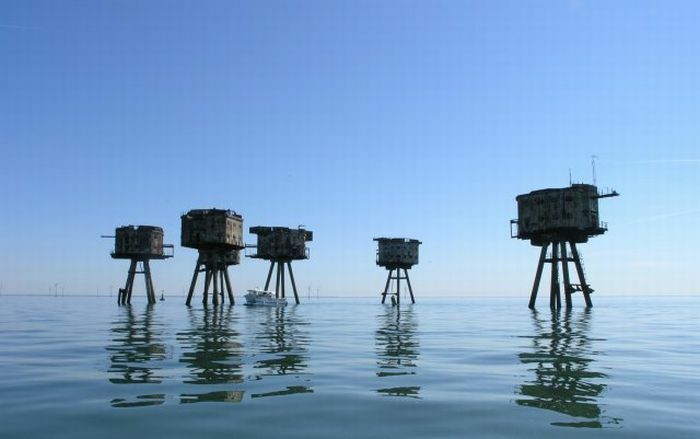 In the Thames Estuary were various marine structures which had been wartime sea forts. Abandoned by the military they made excellent and stable transmitting platforms and were quickly boarded and claimed by further radio entrepreneurs. Soon Radio 390 an easy listening station and the most powerful of all the sixties offshore broadcasters was on air, while from other structures Radio Essex and Radio King started transmissions. Quite interesting. Reminds me a bit of that fort Boyard. They look spindly-legged but I guess the Germans lacked the ability to deliver the necessary ordinance to bring them down. They obviously could not get a ship with large enough guns close enough because of the Royal Navy and I'm guessing that aircraft would not be able to drop adequate bombs on or near enough to the legs to damage them. 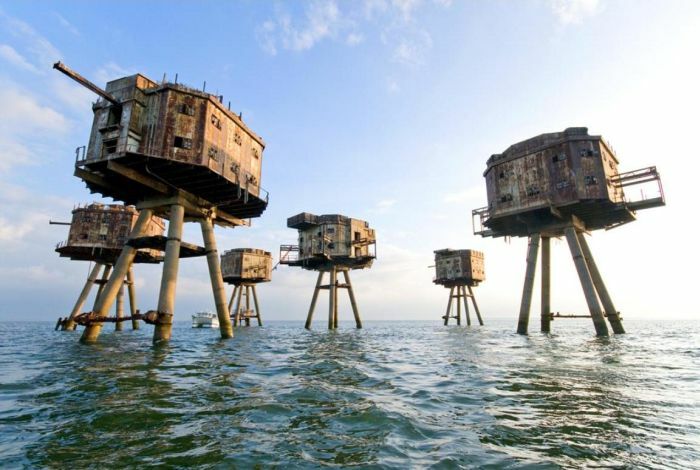 There is a substantial fort to the north of Felixstowe.It is obviously an anti aircraft platform but not to the Maunsell design.It has two legs which are similar to the North Sea oil rigs design.I think it might have been partially dismantled in the last 30 years. I'm surprised it says they saw much action considering they weren't in place until late '43. How many air raids were there after that time? Possibly they may have got a few V1s, but only when they came conveniently close. Does anyone have any accounts of them actually being in action? Unreal, didn't even know these existed! Thanks guys! Interesting links here from back in 2004. 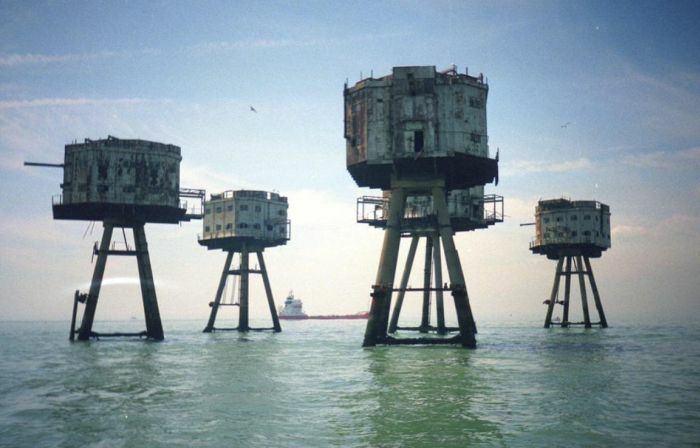 Yes,this is the type.It appears the fort in question off Felixstow was identified as Roughs Tower and later when it was "demobbed" became known as Sealand by the Bates family who thought they could create an independent regime outside the then 3 mile limit.Extension of British territorial waters to 12 miles put paid to that. These marine forts were at times a hazard to those aircrews who forgot to switch on their IFF gear on a return to British airspace.Roughs Tower was not very far off track to those aircraft intending to use Bomber Command's emergency airfield at Woodbridge near to Ipswich. There are actually two types. The one pictured above is a "Navy" fort. There was also an "Army" type that consisted of four mulit-story buildings on a lattice framework connected by walkway bridges. Yes, those were the ones mentioned in the first post, I referred to them as spindly legged. The book The Architechure of War has some good photos of these forts as well as some plan drawings. Basically these were built along the North Kent coast to offer air defence against the Luftwaffe who used the coast as a navigation aid, being that it's a long stretch of coast running sixty-five miles east to west from Margate to the outskirts of London. Originally air defence was sited along the coast to disuade the Luftwaffe, but they simply adjusted their course to be out of range of the land based batteries. 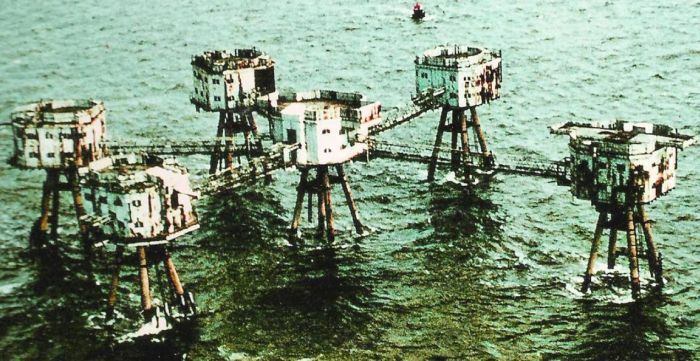 So in 1941 and 42 a series of forts were built off the coast, in the North Sea. Many still stand today, and can be clearly seen from the coast. Below is a view from Whitstable. Maunsell....Mausell....not the same engineer who designed railway locomotives and rolling stock for Southern Railway before the war??? I must admit I don't know either way, I know he ended up running his own company specialising in pre-stressed concrete mainly for bridges - the Hammersmith Flyover being one of his projects. Nowadays it'd be unlikely for an engineer to go from loco's and rolling stock to bridges wouldn't it? But with the war generation absolutely anything is possible. Nowadays, yes - the idea of "big name" engineers has died a death in the UK - along with most of the UK's engineering too, it has to be said! It remained for a while longer on the continent, with "big" names like Ferdinand Porsche of course, and Ing. Fabio Taglioni at Ducati in the 1960's and 1970's. Guy Anson Maunsell (born September 1, 1884 - June 20, 1961) was the British civil engineer responsible for the design of the World War II naval Sea Forts and Army Forts used by the United Kingdom for the defence of the Thames and Mersey estuaries. Maunsell was born in India in 1884. In 1955 he founded the firm of G Maunsell & Partners in the United Kingdom which pioneered the use of prestressed concrete in major bridges. The Hammersmith Flyover, completed in 1961, made revolutionary use of this new construction method and many more structures followed. The firm expanded to Australia, Hong Kong and the Middle East and in time became part of the US-based AECOM Group. He was born on 26 May 1868 at Raheny, County Dublin in Ireland. After graduating from Trinity College, Dublin, he began an apprenticeship at the Inchicore works of the Great Southern and Western Railway (GSWR) under H. A. Ivatt in 1886, completing his training at Horwich on the Lancashire and Yorkshire Railway (as Nigel Gresley had done before him). At Horwich he worked in the drawing office, before occupying the post of locomotive foreman in charge of the Blackpool and Fleetwood District. From there he went to India in 1894, as Assistant Locomotive Superintendent of the East India Railway, being subsequently District Locomotive Superintendent of the Asansol District. He returned in 1896 to become works manager at Inchicore on the GSWR, moving up to become Locomotive Superintendent in 1911. In 1913 he was selected to succeed Harry Wainwright as CME of the South Eastern and Chatham Railway. When that line was incorporated in the new Southern Railway, he became Chief Mechanical Engineer of the latter, retiring in 1937. NOT the same person - but there HAS to be family connection of SOME sort!! !